This photograph, taken in 1894, shows some of the first pupils and teachers of the recently expanded St George’s School outside their new premises at Travers’ College. Up until the late nineteenth century, the main focus of the choir school of St George’s Chapel was to train choristers for St George’s Chapel choir and to give them a little basic education and religious instruction, provided by the canons and the lay clerks. The Archives holds bills from lay clerks in the nineteenth century for services such as teaching the choristers to write. In the 1880s, prompted by nationwide reforms in education, the Dean and Canons invited Walter Baily, one of Her Majesty’s Inspectors of Schools, to assess the choir school. Mr Baily found that on the whole the boys’ education was satisfactory, but that greater attention to arithmetic was needed. He recommended a greater variety of reading material and more opportunity for the boys to write on paper instead of slate. 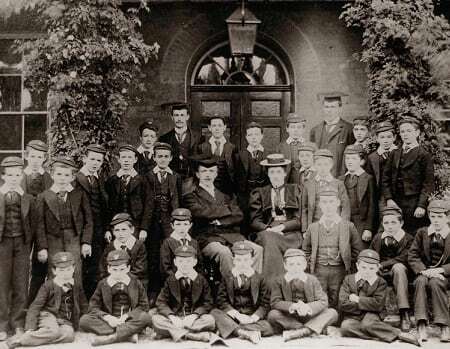 As a result an additional schoolmaster was engaged in May 1886 to teach for three hours each day, focusing on the boys’ academic rather than musical ability. By 1888 another inspection found the thirteen boys at St George’s to have reached higher standards than boys of similar ages in public elementary schools. At this time the Dean and Canons began to think of new arrangements for the future education of the choristers, however the initial suggestions led to clashes between the canons over what was appropriate and in line with the College Statutes. Canon John Dalton, supported by the organist Sir Walter Parratt, first proposed that the school should be moved out of the Horseshoe Cloister and into Travers’ College. The College was, in theory, vacant following the dissolution in 1892 of the unsuccessful foundation, the Naval Knights of Windsor. Opposition came from some of the canons who thought this was a move too far beyond the intentions of the original Foundation. Despite this the Dean entered negotiations with the Admiralty (then owners of Travers College) to obtain a lease. The Admiralty were willing to let the building but the business became very drawn out as the Dean objected first to the price that was asked and then to the condition of the buildings. As the plans progressed it became apparent that the opposition of the canons was nothing in comparison to the resistance of some of the former Naval Knights. Although the four men remaining in residence at Travers’ College were supposed to have left by the end of 1892, the last Governor of the Naval Knights, Commander Willis, refused to be moved. Finally, in March 1893, the Sherriff and his man with the Superintendent of Police and a constable had to forcibly take possession of the property against resistance from within by Willis and his housekeeper. The new school, which opened on 21 September 1893, was designed to provide for thirty boarders, twenty-four of whom were to be choristers, and ten day-boys. The boys are here shown in September 1894 with Headmaster Ashley Bickersteth, his wife Emily (incidentally the youngest daughter of Philip Eliot, Dean of Windsor) and the two masters, Mr Harries and Mr Green. A full history of St George’s School is published in Wridgway, N., The Choristers of St George’s Chapel (Slough, 1980).